As I sat down to right this post I knew there would be some serious nostalgia to accompany my writing. However, I did not know that, as I look through photos of blue skies, warm temperatures, and a jumpsuit with espadrilles, that it would also be freezing and raining outside my window. Peachy. Anyone who knows me knows I love to travel. And if I'm picking my travel destination these same people know exactly where I'm booking my flight- California. I love California. I love that I can go anytime of the year and guarantee it will be at least 65 degrees outside. I love that I can wear shorts and a t-shirt in January. I love that the weather is always perfect for a run. I love that strawberries are always in season. You get where I'm going with this. 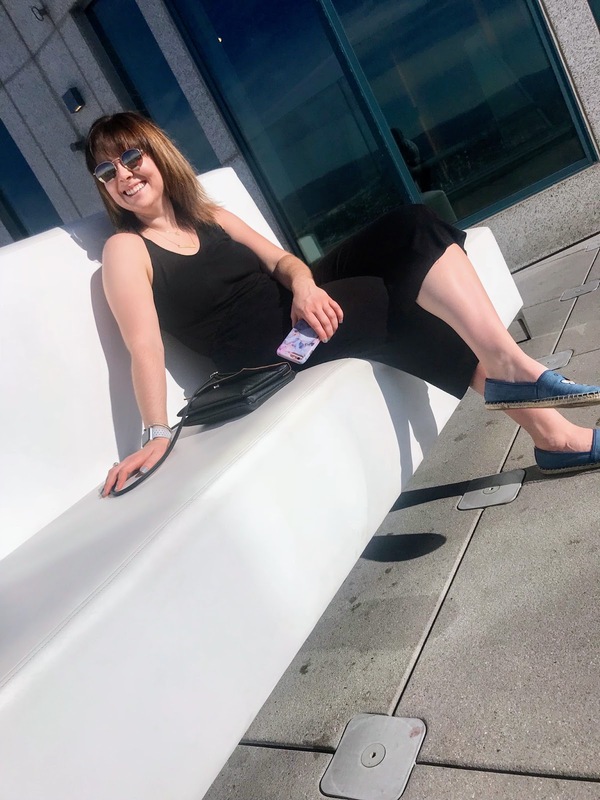 My most recent trip to California was filled all of the things I love- spending time with friends and family, shopping, site seeing, and more shopping. Today, I want to share my favorite part of this trip- Skyspace LA. Skyspace LA is California's tallest open-air observation deck. You go up 70 floors to the top of the U.S. Bank building in Downtown LA and you can see EVERYTHING from 1,000 feet in the air. The U.S. Bank building is a cylinder so when you're in Skyspace, you get a 360 degree view and can see a different part of the city from any one point on the deck. It is breath-taking, especially for someone like me who loves and has dreamed of living in Los Angeles, or California in general, since she was about 9 years old. Truth be told I could have spent hours upon hours on that deck and gotten a nice tan to take home with me. It was the coolest experience as we looked out one direction and saw the Pacific Ocean and, in another direction, saw Dodger Stadium and USC's campus. The pictures don't even begin to do the views justice; it's something you truly must see in person. For me, this is what my vacations are all about and I'll have the memories from this trip forever. It came at just the right time and was the best way I could have imagined starting 2018. I didn't really have any life-changing resolutions for 2018, but one thing I did commit myself to is to make a conscious effort to do more what really makes me happy. I spent a lot of 2017 stressed and worried and I decided I didn't want 2018 to be like that. Doing what makes me happy in 2018 includes spending more time with the people I love and who bring joy to my life, having as many new experiences as possible, and reminding myself that it will be fine, that life will work its way out. Skyspace will definitely be on my itinerary for my next trip to California. One of the other cool things about it that I forgot to mention earlier is that you can see the city at different times of the day and have a totally different experience from the previous time you went. Next time I would like to go up at sunset and watch the sun disappear and see the city lit up at night. Can you imagine how cool that would look?! If you'd like to include Skyspace on your next vacation, check out their website below. I'm telling you it 100% worth putting on your schedule!